Tigers Unleashed ships with some 34 tactical scenarios covering the invasion of Poland and the first two years of the invasion of the Soviet Union. 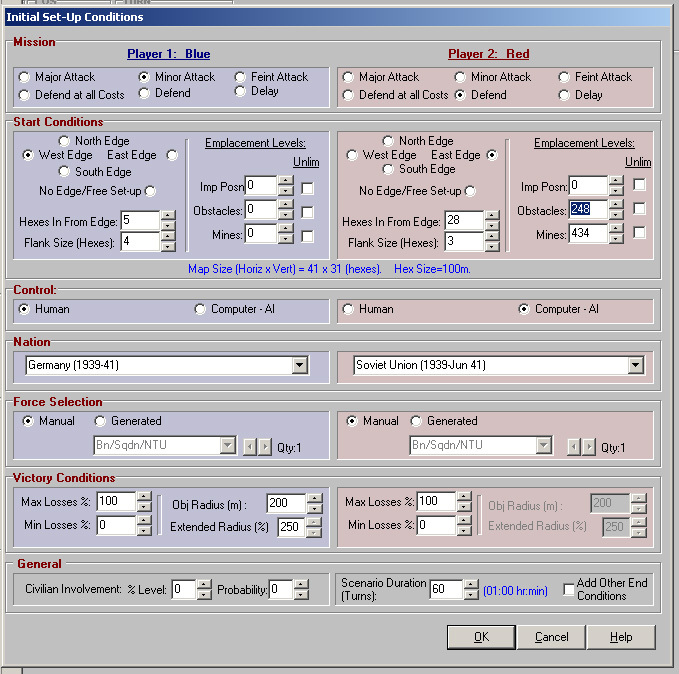 There is also a battle making utility that allows you to pick a map, opposing forces and play that scenario. I'm simplifying things, because the level of detail and available options in Tigers Unleashed is just incredible. Here is an scenario I built from scratch. Nothing too thrilling, just to get my hands dirty with this great simulation. 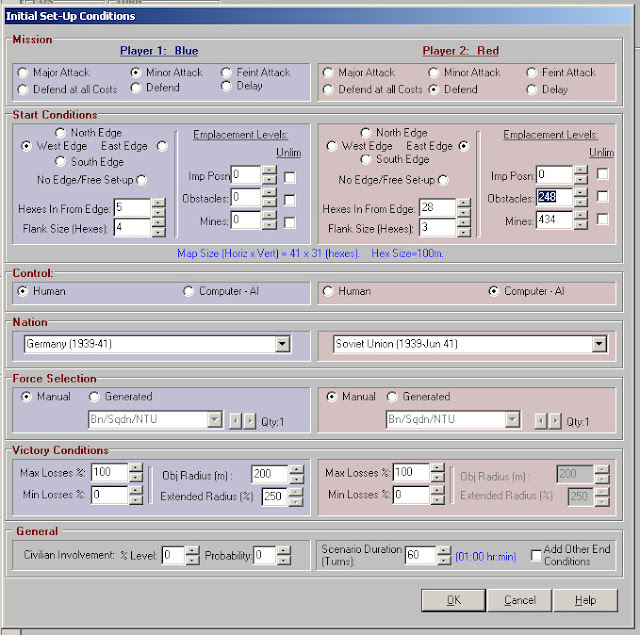 The process of creating an scenario from scratch is straightforward. 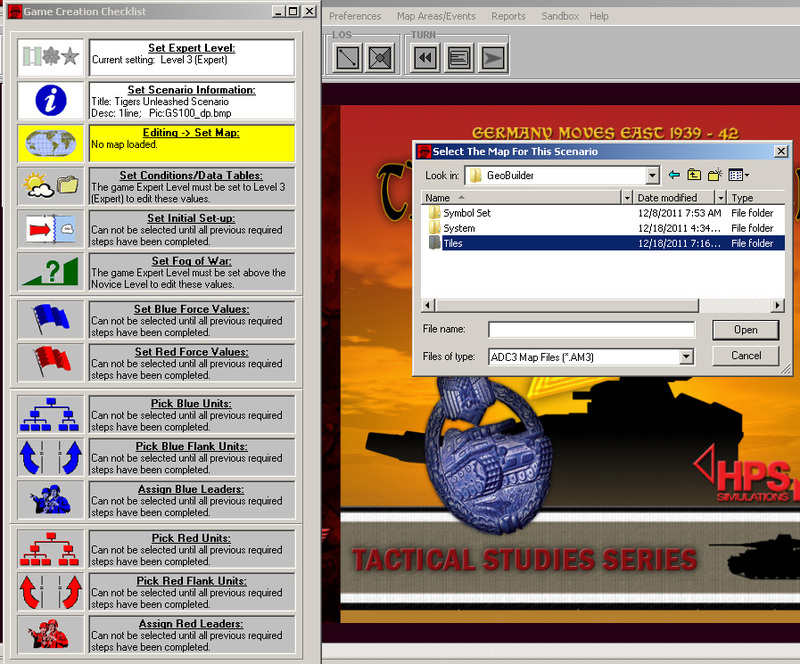 All I have to do is follow a series of steps which are shown in a clickeable window named "scenario creation checklits". First step is to set the expert level of the player: this is how detailed in options and information I want the scenario to be. I choose level 3 (expert). The next step is to enter general scenario information (briefing and the option to have a picture shown in the main menu). Next, I am asked to choose which map I want to fight this battle on. There is a little hiccup in the file structure of the simulation: by default I was offered just four maps, but actually in the GeoBuilder folder there are plenty of other maps to choose from. The clickeable window in the left allows you to go backwards if you missed or changed your mind about a previous step. I'm going to play as the Germans (attacker) and let the computer handle the Soviets (defender). I brought down the amount of obstacles and mines for the defenders. I also gave them an unlimited amount of improved positions. Next step, blue force selection. Options are anything from whole divisions to single platoons. I choose a company-sized team of 2 platoons of MkIVs and one platoon of panzer grenadiers. 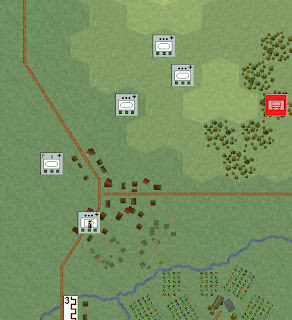 I gave the Russians an infantry battalion reinforced with two AT gun companies. 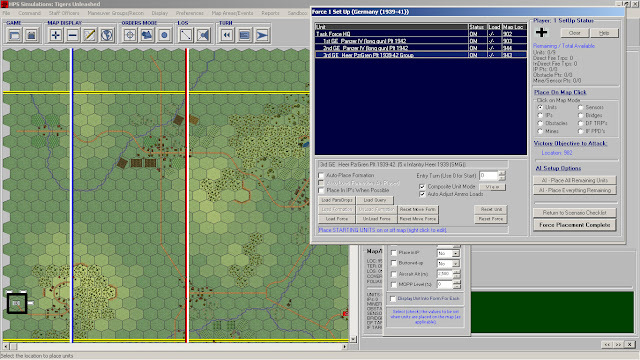 I could have chosen troops for the flanks, or even change how much of the map would be considered flank terrain. In this case I just left the flanks empty. There is also an option to assign different types of leaders to each formation. These leaders vary in their capabilities like their effectiveness to transmit orders, among others. Next stop is compiling an AI template for the scenario. Here is the window of the options available for both sides. After choosing, it's number crunching done by the computer. Now placing my available units in the blue set up area. Of humble size but of high spirit my command is for today. 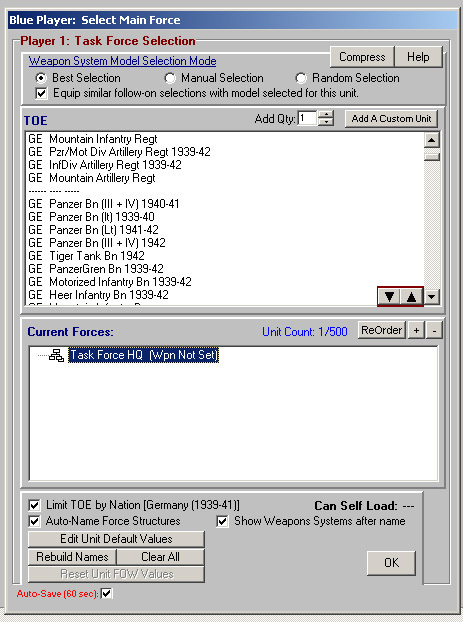 I left the computer to place the red units, but you can choose to modify the computer's choices if you want to. Ready to go now. 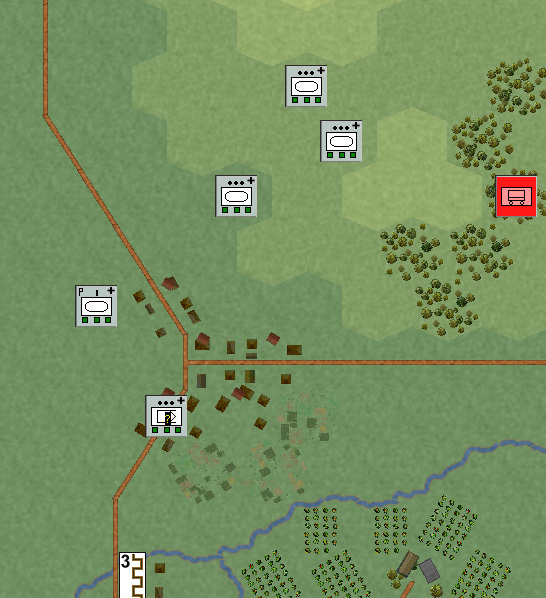 Some Soviet units are shown in the map (red icons): this is because I allowed a moderate amount of intelligence to be available at the scenario start. This level of enemy intelligence can be adjusted during the previous steps of the scenario building process. The type of intelligence (humint, aerial or ground reconnaissance) available can be modified too. Ah, scenario generation. Just as fun as in PoA2. Very inspiring. Giving a first set of orders was a bit less inspiring because of unhandy interface and 30 second delays in LOS calculations. And then PoA2 became unplayable. Resolving a boring turn full of simple movement to contact without fires on both sides for 10 minutes? Gah, we're not in NTC class and player is not been generously paid by DoD for playing this stuff. I hope they did code optimisation in Tigers Unleashed. Otherwise, it could become painful to play a decent scenario. Thanks 9train. More is coming up. @Anonymous: I played PoA2 and off course it was a bit unwieldy at certain points. With this one, though, I am having a better time.